Port-au-Prince, Haiti – A bas Kolera, a bas Minista,– Creole for “down with cholera, down with MINUSTAH,” the United Nation peacekeeping force in Haiti – can be seen spray-painted across Port-au-Prince. One national newspaper headline recently read, “MINUSTAH must go.” And the refrain of a popular song by the Haitian band Brothers Posse mocks UN soldiers. After years of scandal, including allegations of sexual abuse and accusations of introducing cholera into the country, many Haitians want the UN’s third-largest peacekeeping force to leave. But despite calls to leave, the UN Security Council, which recently made a visit to the country to assess its mission, foresees a UN military presence in the country for years to come. Since entering the country in 2004, MINUSTAH has heavily focused on training the Haitian National Police to provide security for the country. They are also mandated to assist with the restoration of the rule of law and public order in Haiti through its own patrols and trainings, to support elections, and to assist the Government and Haitian institutions in promoting human rights across the country. But after pointing to what they say is a pattern of abuse, many Haitians see the UN’s presence as an over-priced occupying force. In 2005, UN raids in Cite Soleil, a slum outside of Port-au-Prince, led to as many as 23 civilian deaths. In December 2007, more than a hundred UN soldiers from Sri Lanka left the country under charges of the sexual abuse of under-age girls. Video emerged in the fall of 2011 purportedly showing the sexual assault of a young Haitian man by Uruguayan soldiers. And MINUSTAH soldiers have been blamed for the cholera epidemic which has so far killed more than seven thousand Haitians and affected the lives of hundreds of thousands of others. According to a recent survey by researchers at the University of Haiti, many Haitians agree. In the study completed in four neighborhoods in Port-au-Prince, only 24% of respondents “agreed” or “strongly agreed” that the UN’s presence in Haiti was a good thing. 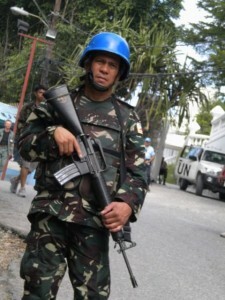 In September, the Senate voted to request a gradual withdrawal of the peacekeeping mission over the next three years. They have also reinstated the Haitian army, which was disbanded in 1995 after years of abuse, including dozens of military coups. But the international community believes MINUSTAH’s presence is still needed. Calls for a new army are largely seen as a “distraction,” according to one Security Council ambassador, especially in a country with high unemployment, bad infrastructure, and public health. President Martelly argued that an army is needed to patrol borders and protect the environment, and he spent the majority of his private meeting with Security Council trying to convince them of the need for one, according to one ambassador. At a cost of nearly $800 million per year, the UN is trying to find ways to reduce peacekeeping expenses around the world, and it will cut about $1 billion from peacekeeping expenses in 2012, according to Hervé Ladsous, the UN Under-Secretary-General for Peacekeeping. It is unlikely that MINUSTAH’s budget will be drastically cut. The Haitian government and the United Nations have set a goal to train up to 16 thousand police officers by 2016, and perhaps more beyond that.